What is Cecarrelli Fat Lipolysis? Cecarrelli Fat Lipolysis is a new innovative fat lipolysis Mesotherapy solution formulated in the research laboratory of Professor C Ceccarelli, a regenerative and physiological scientist in Rome, Italy. What are the 10 Reasons why you should have your fat lipolysis at Body Renewal? 5. Ceccarelli treatments are administers by our experienced doctors and not by unqualified personnel such as beauty therapists or gym instructors. 8. No severe, nasty side effects such as fat and skin necrosis which can happen with Phospahtidyl Cholne PPC / Depxycholate due to the high concentrations of Deoxycholate objects by unqualified personnel. Deoxycholate in high concentrations, ruptures the cell membrane and results in the instantaneous release of potentially harmful enzymes and inflammatory mediators. 10. Only 1 to 3 treatments are necessary compared to other fat lipolysis treatments which need at least 6 to 8 treatments to get the same results with potential side effects. Why have we introduced this new method of resistant fat lipolysis/dissolving into Skin & Body Renewal? How does it work to dissolve fat? The new Ceccarelli solution uses the Fenton reaction/metabolism to enable the aesthetic practitioner to re-sculpt the contours of the face and body using a solution made up of Vit C and Fe. 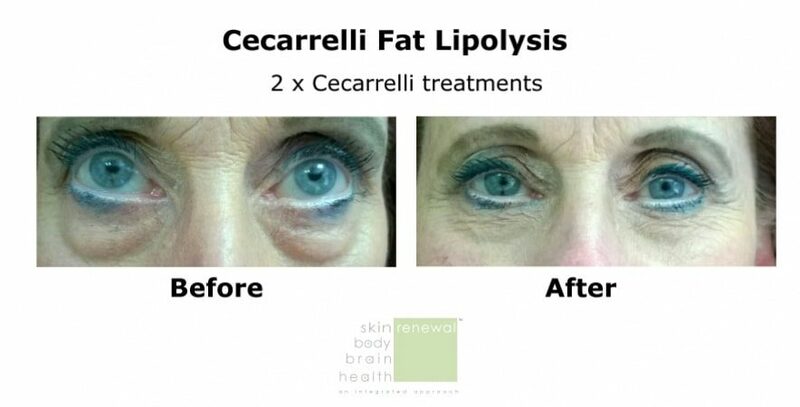 The Ceccarelli lipolytic solution, when injected, acts on the fat cells and causes a process of natural fat cell death (also called fat cell apoptosis). ​Why is Ceccarelli Fat Lipolysis a safe treatment? This new aesthetic treatment is physiological and regenerative in nature. It works in tandem with processes naturally employed by the human body. Being physiological these treatments appeal to doctors as they represent the highest levels of effectiveness and safety. Because it is a physiological treatment method it is considered to be safe. Patients with allergies to Vit C and iron should not be considered for this treatment. ​How is the Cecarrelli Fat Lipolysis different from Phosphatidylcholine/Sodium Deoxycholate lipodissolve? Cecarrelli Fat Lipolysis also uses a Mesotherapy solution of Vit C combined with minute portion of Fe which will not harm the body and does not cause the major swelling and inflammation that occurs after PC/ Deoxycholate injections. In addition, the results for fat dissolving from the Ceccarelli solution are far superior. ​How many treatments are needed? This depends on the amount of fat in the area that needs to be dissolved. Usually 2 to 3 treatments are necessary if there is a moderate amount of resistant fat. The advantage of this treatment is that 4 x the amount of vials/mls (compared to PC) can be injected in each procedure as it only causes minimal swelling after the procedure. With the Ceccarelli fat lipolysis treatment, less sessions are needed as opposed to the traditional PC/ Deoxycholate fat lipolysis which needs 6 to 8 treatments to get the same result. Treatments can be repeated every 2 to 4 weeks. In most cases, one treatment is sufficient but up to 3 treatments can be necessary over a 6 to 8 week period. What are the major side effects of the Cecarrelli Fat Lipolysis? There are no major side effects after Ceccarelli lipolysis as the treatments is physiological. After the treatment there may be bruising (due to the injections) and very mild swelling. How quickly does one see a result of fat reduction? Fat reduction results are evident the very next day, but the best results are seen after 2 weeks. ​Which patients are suitable for Ceccarelli fat lipolysis? Injections with Ceccarelli Solution should not be seen as an alternative to liposuction. The maximum volume to be injected at a single session is 200 ml. No area on the body larger than two hands should be treated using Ceccarelli. It is not a weight loss treatment, neither is it a treatment for obesity. Large fat collections (e.g. a huge tummy) is a contra indication for use. Ideally it is a treatment for a resistant localized fat deposit in an otherwise slim body. Results cannot be guaranteed and it is important to maintain a healthy body weight after treatment. New weight gains will result in re growth of fat in the treated area. ​Does one need to do a radiofrequency procedure after the Ceccarelli lipolysis procedure? No, a radiofrequency procedure is not necessary as there is no swelling and inflammation after the procedure. A radiofrequency procedure has to be done after PC/Deoxycholate lipolysis to prevent the massive swelling that occurs after the procedure. 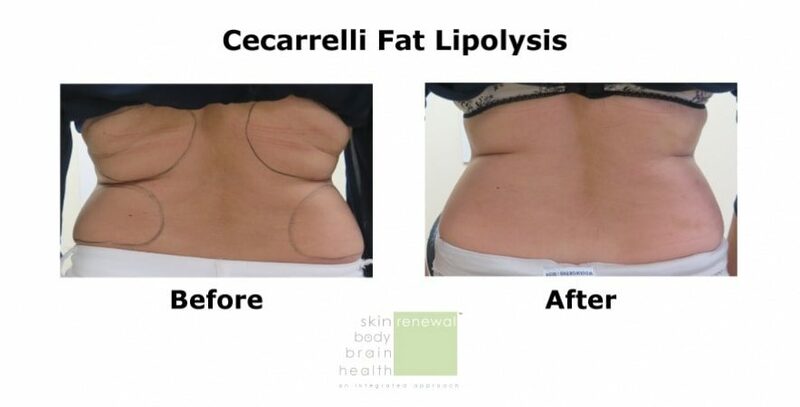 ​What other treatments can be combined with the Cecarrelli Fat Lipolysis? Most treatments can be combined with this procedure. In fact, PDO tightening and firming threads can be inserted straight after with Ceccarelli lipolysis treatment (in the same treatment ) which will help firm and tighten the skin in the treated area. What areas of the face and body can be treated with Ceccarelli fat lipolysis? This treatment can be used on any area on the face and body where RESISTANT fat is present and includes jowls and jawlines, naso labial bulges and submental fat collections. Face: eye bags, fatty nasolabial folds/bulges, fatty jowls and double chin, fatty jawline. Body: Resistant fat on tummy, love handles, inner thighs, saddle bags, bra bulges, bat wing arms, knees, cankles and cellulite bulges. ​Can all skin types be treated? 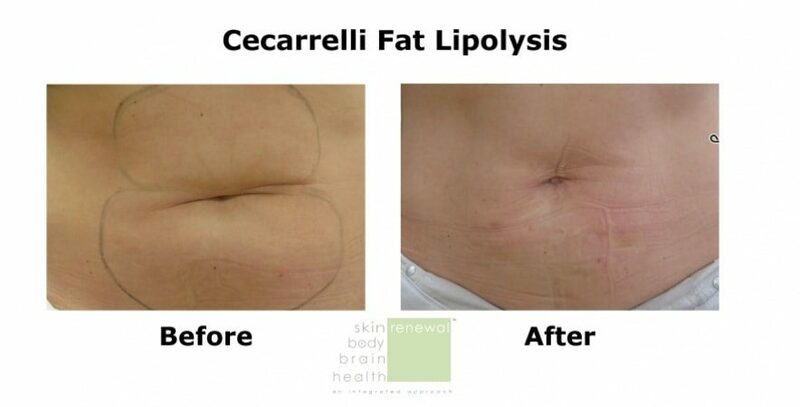 Yes, the Ceccarelli fat lipolysis is safe for all skin types. What is the cost of Ceccarelli fat lipolysis? The cost of Ceccarelli is the same price as for the PC/Deoxycholate fat lipolysis. The beauty of the Ceccarelli is that 4x the amount of traditional Mesotherapy/Deoxycholate can be combined in one treatment in order to get superior fat dissolving results. ​What is traditional fat lipolysis? Mesotherapy is a minimal invasive procedure which employs a series of multiple injections of various pharmaceutical and homeopathic chemical agents into the selective areas of fat. Mesotherapy injections target fat cells by inducing fat cells to rupture and/or causing cellular death. A patient may feel burning and irritation at the injection site and experience swelling at the time of the injections and immediately afterwards. The most common agents injected are Phosphatidylcholine/Sodium Deoxycholate. Unfortunately, the Deoxycholate, which contributes to the majority of the fat dissolving effect, causes a major inflammatory reaction to get the desired result and a maximum of 50mls of this Deoxycholate or PC is allowed per treatment. To avoid complications, ensure that only an experienced medical doctor does your lipolysis treatment as serious side effects such as necrosis of the overlying skin can manifest post procedure if the treatment is not done correctly. What different Mesotherapy lipolytic solutions are there for resistant fat dissolving? 1. The first treatment option is by speeding up fat cell metabolism. Substances like phophatidyl choline (PPC), carnitine, caffeine and aminophylline belong to this group. 2. The second treatment option is to rupture the cell membrane. Deoxycholate, a bile soap, is contained in many preparations and is commonly used in lipolytic treatments. Rupture of the cell membrane results in the instantaneous release of potentially harmful enzymes and inflammatory mediators. Nasty complications have been reported using such drugs especially those containing high concentrations of deoxycholate. 3. Ceccarelli Solution contains Vitamin C, iron and lignocaine. In South Africa it is manufactured by Rausakem, a Cape based compounding pharmacy that is fully owned by a global compounding company, Fagron. The product is not available without a doctor’s prescription and can only be administered by a doctor. Once compounded it is advised that the product is used within 7 days mainly for stability reasons.